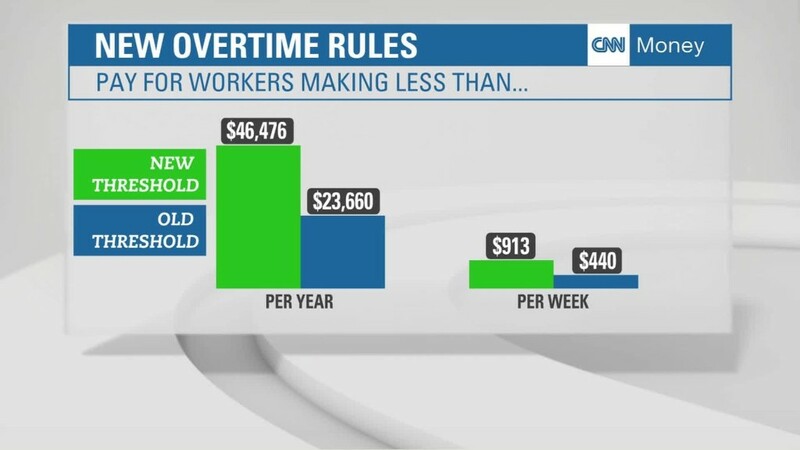 Starting later this year, millions more workers will become eligible for overtime pay. Under a new rule announced by the White House Tuesday, anybody making a salary of less than $47,476 ($913 a week) will automatically qualify for overtime pay when they work more than 40 hours a week. That's roughly double the $23,660 threshold (or $455 a week) that's currently in place. The change -- which has been criticized as too drastic by many employers -- will go into effect on Dec. 1, 2016. It is intended to expand access to overtime pay for otherwise low-salaried workers who log long hours but have been treated as exempt from overtime because they perform some managerial duties. Vice President Joe Biden characterized the changes as "restoring and expanding access to the middle class." The percent of salaried workers automatically eligible for overtime has fallen to 7% from 62% in 1975. Under the new threshold, 35% of salaried workers will become automatically eligible, according to Labor Secretary Thomas Perez. The new threshold will be updated every three years to make sure it stays at the 40th percentile of full-time salaries in the lowest income region of the country. Based on wage growth projections, that means it could rise to $51,000 by 2020. In figuring out whether salaried workers' income qualifies them for overtime, employers will be allowed to count their bonuses and commissions up to 10% of the threshold. So, for instance, if someone makes $44,000 today and gets a $4,000 bonus, his total income ($48,000) will mean that he will remain exempt from overtime. The Labor Department estimates the rule change could result in an additional $12 billion in pay for workers over the next decade. The change is expected to affect the retail and restaurant industries the most. But it will also affect all private sector industries, as well as government offices and nonprofits, from social service organizations to universities. The upshot for workers could be more pay or more free time or in some instances, neither. Some will earn more because they will receive overtime pay or will simply get a raise to put them over the salary threshold. Others may be restricted to just working an 8-hour day. For some companies, the thinking may well be "if 20% [of my expenses] is labor costs, after the overtime rule goes into effect, it's still going to be 20%," said Michael Lotito, a lawyer for Littler Mendelson, a firm that represents employers. While Perez acknowledged that theoretically this could be a potential outcome for some low-salaried managers, he's confident employers won't take that route. "You don't respond to any employee by lowering their wages. But it's particularly imprudent to do so with folks who are running the place. It's inconsistent with rational behavior."